Jaipur is the capital and largest city in Rajasthan. The city is also the tenth most populous place in India. 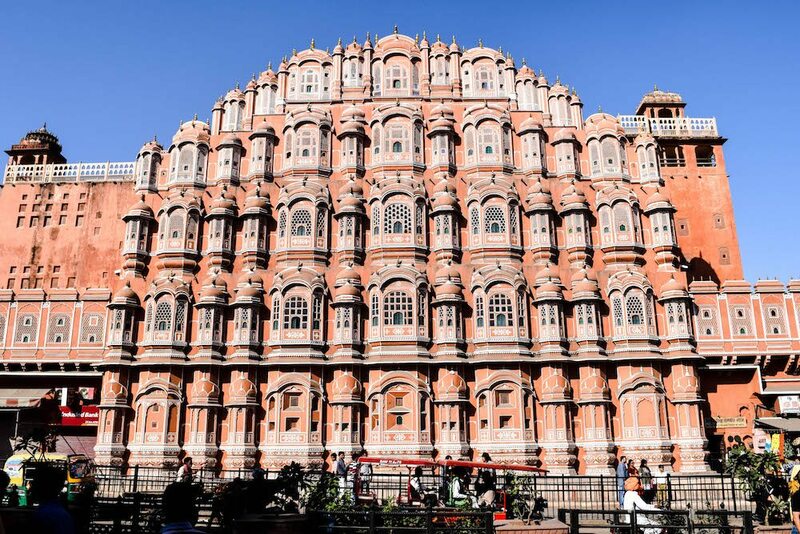 If you’ve heard about Jaipur before, you probably know it as the Pink City. Because, yes, many of the buildings are painted a pinkish colour. We had a bit of a love/hate relationship with Jaipur, mostly because it can be an overwhelming, chaotic experience to arrive in Jaipur. 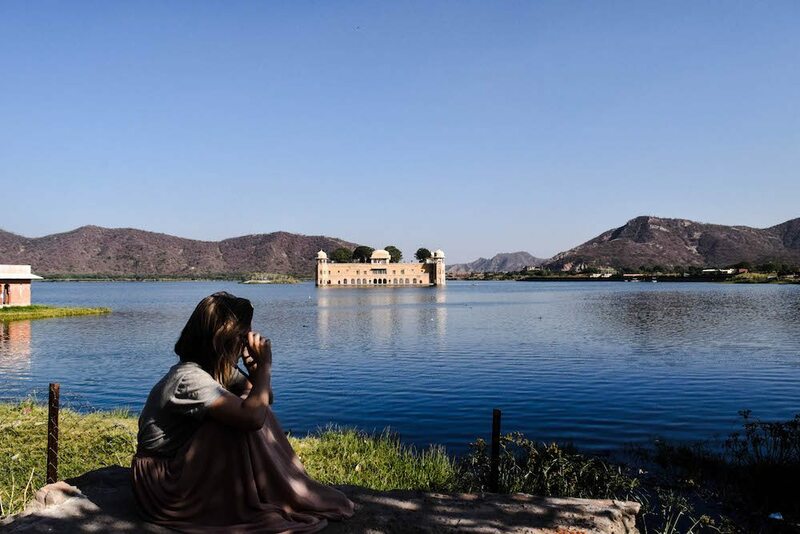 It’s a place that has to grow on you and looking back at the photos I have to admit that Jaipur has some impressive and amazingly beautiful sights to see! There are a lot of historical places in Jaipur which can tell you a lot about India back in the day. Expect a lot of forts, palaces, temples and architectural artworks in this article! 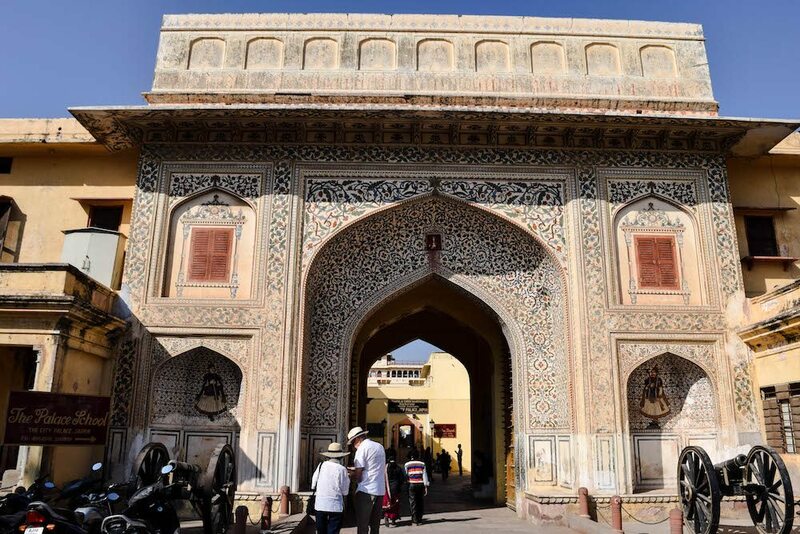 In this post we share 10 places to visit in Jaipur and surrounding areas. If you’re not sure where to stay in Jaipur, we highly recommend the very affordable and luxurious Pearl Palace Boutique Hotel. But be quick, they are often fully booked! Fort Amber, also know as Fort Amer, was our favourite sight in Jaipur by far. It’s actually one of the most famous forts of Rajasthan. The red and white stone fort just has something magical and fairytale like. There are so many beautiful little details, such as carvings on the walls and ceilings. The architecture is a mix between Rajput and Hindu style, while the decoration is a mixture of Muslim and Hindu style. You definitely need a lot of time to explore Amber Fort. In the fort you can find beautiful buildings such as Diwan-e-Aam, Sheesh Mahal and more. There are four different parts and each has their own entrance. Be sure to bring enough water with you! It’s situated 11 kilometers from Jaipur, so we recommend to take a rickshaw to get there. Nahargarh Fort is a beautiful historic fort standing on the edge of the Aravalli Hills, giving a breathtaking view over Jaipur. Like its neighbour Amber Fort, Nahargarh Fort provides impressive delicate carvings and stonework. On the premises of the fort you can find Madhavendra Bhaven, a hall designed with beautiful murals. From Nahargarh Fort there is an extended wall that connects it to Jaigarh Fort. 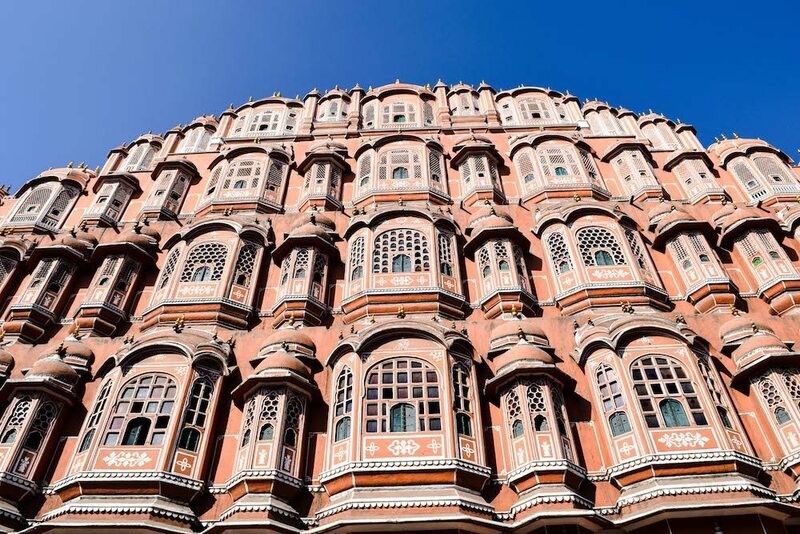 Hawa Mahal is one of the most popular tourist spots in Jaipur, as it’s a remarkable piece of architecture with a distinctive pink colour. The honeycombed palace of five storeys high was constructed in 1799 by Maharaja Sawai Pratap Singh so that women of the royal house could watch everything that was going on outside, while safely remaining inside. Ironically, we only saw Hawa Mahal’s facade and never went inside. We did take a million photos of it though. Jantar Mantar is a very unique observatory that was built in the 18th century as an astronomical observation site. There are actually five observatories that each have their own function for astronomical measurement. The structures are very striking because of their geometric forms. The Jantar Mantar is actually a UNESCO World Heritage Site and the best preserved, most significant and most comprehensive historic observatory in India. We never made it inside the City Palace, as we had to think of our budget at the time, so we only took a glance at the entrance. After doing some research we found that the City Palace has a lot of beautiful doors and archways, many courtyards, gardens and buildings. If we would visit Jaipur again we would definitely go inside this time! Near Amber Fort you can find the Anokhi Museum of Hand Printing. It’s located in a beautiful Haveli and displays a selection of block printed textiles, images, tools and related objects. They have a permanent collection of clothing, home furnishings and fabrics dating from the early 1960s to the present, but they also have exhibitions that change over time. One of the reasons that Anonkhi Museum is popular is definitely also the impressive architecture of the Haveli. Jal Mahal, also known as the water palace, appears to float in the Sagar Lake. Honestly, this palace was a bit of a disappointment for us. Not because of how it looks, because it’s definitely a peaceful sight to see. No, it mostly was a let down because it was very smelly near the waterside, most likely because of the huge amount of trash that was thrown in the water. Hopefully people, both locals and tourists, will become more conscious of this and take their trash with them. In total there are three famous forts in Jaipur: Amber Fort, Nahargarh Fort and Jaigarh Fort. Like mentioned before, the walls of Nahargarh Fort are extended over the hills and connect with Jaigarh Fort. The red sandstone fort has thick walls and is home to gorgeous palaces with scenic landscape. 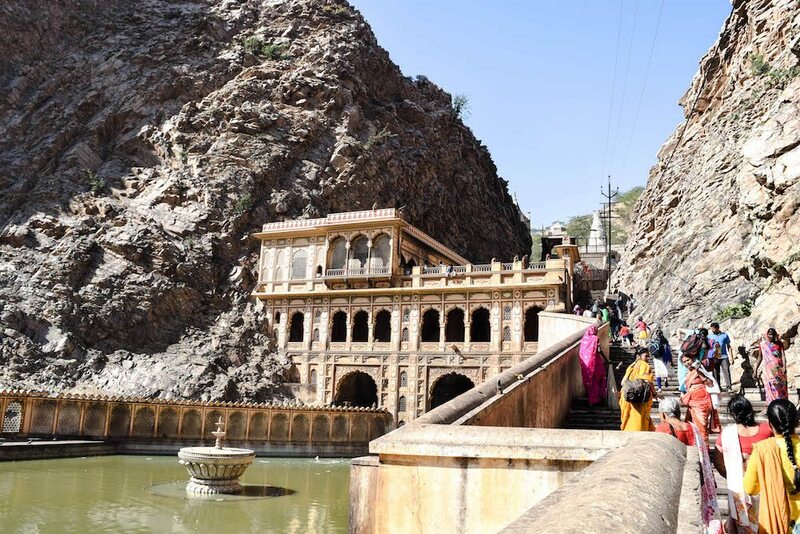 Galta Ji is also known as Monkey Temple because of the large colony of monkeys that live in the area. You really have to be careful with them though, as the monkeys can be quite cheeky and can, well, attack you. A lot tourists want to give them food or play with them, but this can actually make the monkeys aggressive. My advice would be to just try to leave the monkeys alone. We found this temple to be quite special, the architecture is impressive yet it does need a bit of maintenance here and there. There is a bath with holy water where locals go to take a bath. If you walk all the way to the top of the hill you also have an amazing view over Jaipur! Sisodia Rani Bagh is a royal garden with walls that are covered in paintings with the love story of Krishna and his true love Radha. In this garden you will find lush flowerbeds, foliage, fountains, galleries and more. You can find Sisodia Rani Bagh 10 km from Jaipur on the way to Agra. That were 10 places to visit in Jaipur. If you want even more inspiration, check out more tips on TripAdvisor. Have you ever been to Jaipur? We would love to know your experience, let us know in the comments! Jaipur is a hot state in terms of temperature. Excessive heat can spoil the immense beauty, culture and colors it has to offer. So anything from Mid Oct to Mid March should be ideal. Wow! Jaipur seems so picturesque and an awesome travel destination. It definitely had lots to offer, Jeffrey and Lisanne. 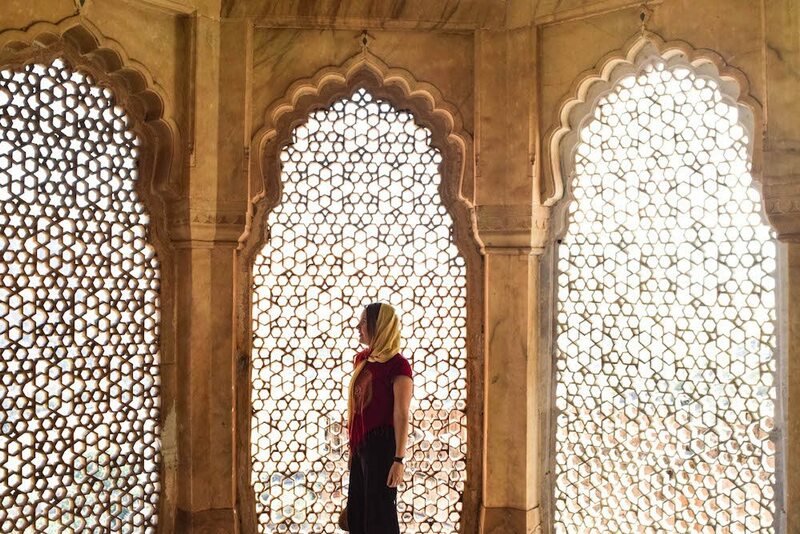 When would it be the best time of the year to explore Jaipur?